Baum Squad: The Baum Family Blog: Happy Christmas! 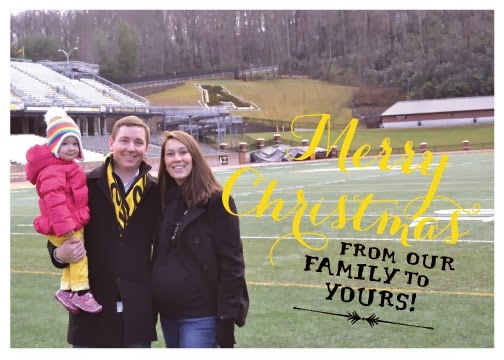 Welp, things have been pretty hectic for the Baums, and as a result I did not get to post my "Merry Christmas" message or Baby Boy Baum's 33-week update. Whoopsie! Just wanted to check in to let you know that we're still here! Due to an unexpected death in the family, we have some more travel coming up at the end of this week, so posts will probably be sporadic but hopefully we can get back on track next week. We have flown with Lilly a few times before, but not recently. She is VERY active, so I'm looking for suggestions of ways to keep her entertained on the plane. If you have any, please send them my way! Luckily, the flight is relatively short, so hopefully a new Elmo episode downloaded on the iPad and people watching will do the trick! I hope you and yours had a wonderful Holiday and that you have some fun, crazy plans to ring in the new year! Due to our recent change of plans, we're now going to be home and boring on NYE - we'll probably spend it sorting through Lilly's things from the attic so that I can get a better idea of what we have and what we need for Baby Boy. When did I get so old? Ha! 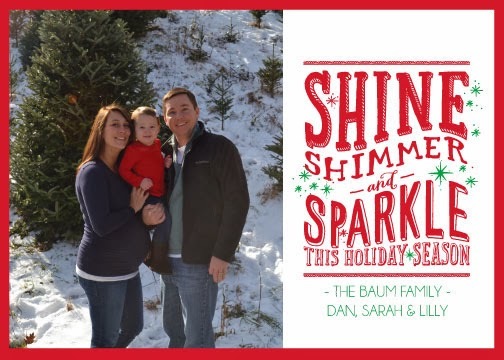 I'll leave you with this year's Christmas card, courtesy of Deb Hall of Olive Paper. If you recall, she did Lilly's first birthday party invitations last year and we have used her for a number of things since. She is fantastic and I could not possibly speak any more highly of her. If you have a need for anything paper-related, holler at Deb - she will not disappoint!!! This may be my favorite card yet. So cute! I hope to be back sooner than later with a Holiday recap. Hope yours was wonderful - Merry Christmas and Happy New Year from my family to yours!